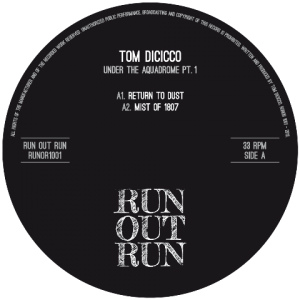 Having released before on Traut Muzik, Inner Surface, Semantica and other labels, the UK producer Tom Dicicco launches his own imprint Run Out Run with a four-tracker. 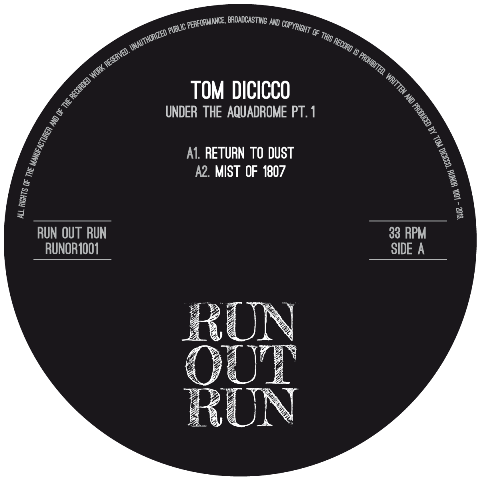 Mostly dedicated to the rugged side of British techno he starts with top-end track “Return To Dust” which is exposed to the firm grip of expressive machine language. It’s centered on a metallic riff that makes it a good mix with “Echo Final” by Schalt 42 aka Richard Bartz. “Mist Of 1897” and “Werk” stay close to the rumble on the floor with complex techno textures until the beats are cut off in “Plate Subduction”, a tranquilizing conclusion of the release feeding the imagination with sun & sea metaphors. Dicicco might not break any barriers with “Under The Aquadrome Pt. 1” but still provides a decent addition for the DJ bags.